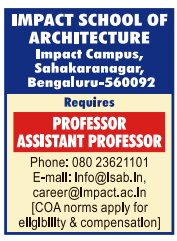 Impact College of Architecture, Bangalore has advertised for recruitment of Teaching Faculty- Professor / Assistant Professor jobs vacancies. Interested and eligible job aspirants are requested to apply immediately from 05th December 2018. Check out further more details below. About College: IMPACT Group, founded in the year 1980, is a private charitable Society offering undergraduate and graduate degrees in engineering, architecture, business, design, human sciences, applied technology, and management studies. Founded on strong intellectual footings, the IMPACT Group offers exceptional preparation for professions that require technological sophistication, an innovative mindset, and an entrepreneurial spirit.